Dead Man's Steel is the third and final volume in the Grim Company Series by Luke Scull. We reviewed the first book in the series - The Grim Company - back in 2013 and remarked that it was one of the best fantasy books of the year. Last year the Sword in the North, the second in the series managed to build on the first book and was a worthy follow-up. This time around we've even managed to get one of our quotes on the front of this book - not something that happens very often and humbling when it does. As we begin Dead Man's Steel things are looking pretty Grim indeed - The Age of Ruin is almost complete with demonspawn swamping the lands from the north while in the west the Fade have returned, vowing to eliminate mankind. Godswar, the ancient weapon of power has been unleashed to ravage what remains of the land and those Magelords who have survived seem unwilling, or unable, to help. The only hope lies with the surviving members of the Grim Company: Davarus Cole, Brodar Kane and Eremul the Halfmage. So quite a bleak start; it is worth remembering that this an example of GrimDark fiction and so things are unlikely to be smelling of roses. I, like many, consider the late, great David Gemmell to be one of the founders of this sub genre and in many ways Luke Scull's series plays tribute to this author especially with the depiction of the grizzled, old warrior who has lived past his best days. The book packs in a great deal, Warriors from the North, a demon scourge, an invasion from a race that appear to be almost invincible and on top of all that an "ancient" weapon of immense power. The characters are well defined and help to draw you in to the plight of the land while the pace steadily builds to the climactic, spectacular conclusion. The story itself is creative and entertaining, there is so much going on that there are no quiet moments. The tone manages to avoid becoming too bleak while still making you wonder just what more can happen to these poor souls. 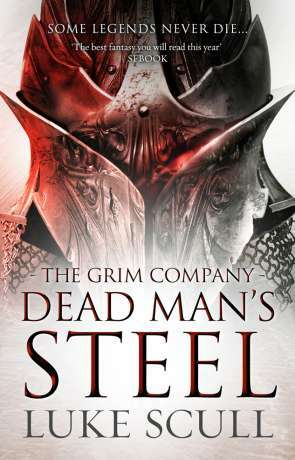 Dead Man's Steel continues this incredible story that begin three years ago with The Grim Company, it's rewarding, exciting, fantastic fiction. A great cast of characters and rewarding story combined with a fitting finale solidifys this as one of the finest fantasy series of recent times. Written on 23rd December 2016 by Ant.